Charming Cottage--Walk to Douglas Beach! SPRING SPECIAL! MENTION THIS AT TIME OF BOOKING AND RECEIVE $25 OFF STAYS IN APRIL! Recently updated charming single-family home vacation rental on cul-de-sac in Douglas, located at 3060 Park Drive, south off Center Street. With a short walk to the Douglas Public Beach on Lake Michigan, you will not be disappointed when you arrive to relax in this lovely home. With 1300 square feet of living space you definitely will not feel cramped. The Pottery Barn furnishings complemented by personally chosen antiques abound throughout this professionally decorated home. See why this property is fully booked every Summer season! Main Living Area: The Living Room area opens onto a screened porch that runs the length of the home. Enjoy relaxing on the porch, with its wicker love seat, chairs, tables and reading lamp. Abounding with light from the 3 sets of French Doors, the front living area feels open and peaceful, bringing the outdoors inside (don't be surprised if you see a family of deer outside the front porch). The main level also has one bedroom and a full bathroom. Second Floor Living Area: On the 2nd level, there are 2 additional bedrooms and 1 bathroom. The second bedroom has 1 queen bed with plenty of closet space. The third bedroom, nick-named the 'Cowboy Room' contains 2 twin beds. Both bedrooms are bright and charming. The 2nd floor full bath is large and spacious. Area Info: You'll love the location of this home, within walking distance of Lake Shore Drive where you can enjoy gorgeous sunsets, and the lovely Douglas public beach (0.4 miles). It's only a short drive or an easy bike ride to downtown Douglas or Saugatuck for dining, shopping, or boating. Douglas, Michigan is the proud recipient of the National Trust for Historic Preservation, Distinctive Destination Award. Douglas is approximately 10 miles south of Holland, Michigan. LARGER GROUP? CHECK OUR SISTER PROPERTY NEXT DOOR! A LUXURY 4 BEDROOM NEWLY CONSTRUCTED COTTAGE! 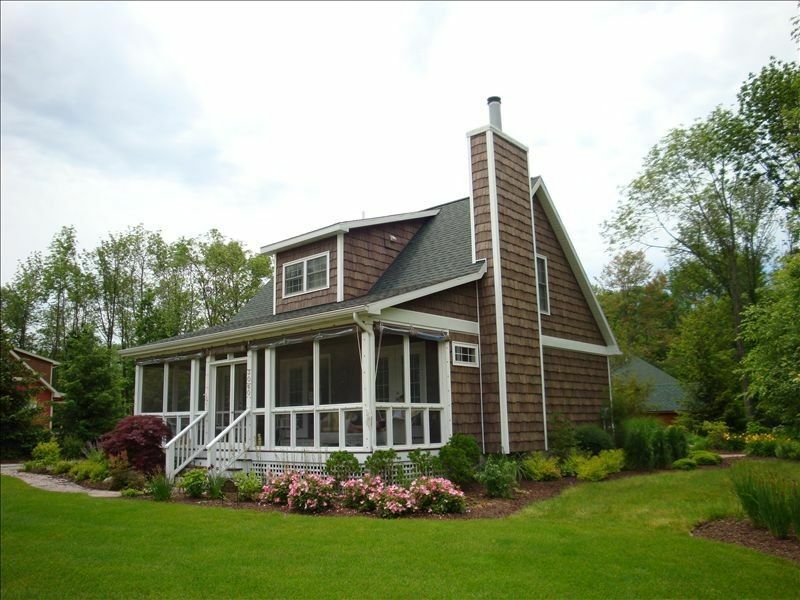 Some close friends of mine also own second homes in the Douglas and Saugatuck communities. With its beautiful beaches, terrific restaurants, and nearby entertainment, Douglas and Saugatuck is worlds away from Chicago! A few CDs on site for your enjoyment or bring your own CDs. You can also use your IPod or MP3 player with the stereo system. A few DVDs on site for your enjoyment or bring your own. (2) Secluded patio in rear of house w/ table seating for 6, chairs and umbrella; gas grill. Screened-in porch along length of house with 1 love seat; 2 rocking chairs and reading lamp. This is my third time staying in this home and this group of people I brought along this time really enjoyed it also. It’s bright and cheery colors and decor add just the right touch. Easy access to town yet just enough privacy. Very clean, convenient to dining and lake. Host was easily accessible in the event needed. We feel very rested. It's a very charming cottage with all of the necessary amenities. We enjoyed just relaxing and reading by the fire and a local eatery was very good as well. Conveniently located!! Charming, clean, well appointed and a great location. This home provided a wonderful family holiday experience. The rental is cozy and cheerful and located very near the Lake presenting great walking opportunities. We highly recommend it! This property was delightful! We thoroughly enjoyed our stay. The owner went out of his way to make sure there were good quality immenities.